Prince Fielder, Texas Rangers' designated hitter and first baseman, is expected to have season-ending surgery. Fielder went on the disabled list shortly after the All-Star break and was seeing doctors for opinions on his neck. Fielder also had season-ending neck surgery to repair a herniated disk in May 2014. Fielder has now played 289 games in two-plus seasons with the Texas Rangers, which adds up to a little less than two seasons of work even though this is his third year in Texas. With Fielder struggling mightily early this season, batting just above .200, the Rangers are not totally crippled by this injury. It will however cut into the Rangers lineup flexibility and overall power, not to mention his $24 million contract this season can be considered mostly a loss (though Detroit is paying $10 million of it). Get ready for a lot of Jurickson Profar and possibly Joey Gallo if no trades are made before the Aug. 1 deadline. Fielder got a second opinion Monday, and general manager Jon Daniels said Dr. Drew Dossett recommended surgery. That was the same as Dr. Robert Watkins in Los Angeles said last week after an MRI showed a herniation between Fielder's C4 and C5 disks. While Daniels didn't want to speculate on the long-term future for the 32-year-old Fielder, the GM did acknowledge the seriousness of having a second surgery in close proximity to the first. "He rehabbed once from it and came back. I think with each additional surgery in that area it increases the risk involved and just the overall, his ability to get back," Daniels said. "But it's not for me to speculate about that here today." Dossett, a specialist in Texas who works with the Rangers, performed Fielder's surgery in May 2014 when he had a cervical fusion of two disks just below the area that is bothering the slugger now. Fielder has hit a career-low .212 with eight homers and 44 RBIs in 89 games this season. He had recently been feeling weakness and discomfort in his neck and left arm, similar to what he felt two years ago before surgery. "I just know that post-All-Star break last year and through the playoffs, and then just kind of inconsistency of this season, there were times he'd show you a spark or two, and then it would just kind of evaporate," manager Jeff Banister said. "There were times when the ball still came off his bat at 100 miles an hour. But I don't know this season that this was who we'd seen in the past." Daniels said it seems like Fielder was feeling discomfort for some time before the MRI last week after acknowledging that there was an issue. "I think he just wanted to play, and wanted to push through it," Daniels said. Fielder wasn't in the clubhouse before Monday night's home game against Oakland. The Rangers got Fielder in a November 2013 trade from Detroit, when they sent second baseman Ian Kinsler to the Tigers. Fielder, who is in his 12th major league season, is signed through 2020. 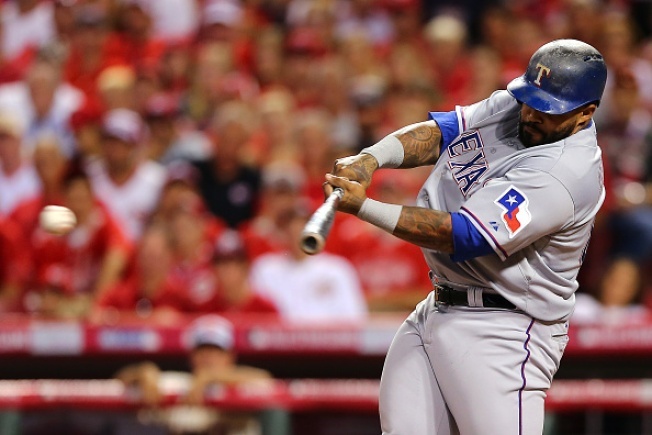 Fielder was limited to 42 games during his Rangers debut in 2014, when he hit .247 with three homers and 16 RBIs. Fielder rebounded with a .305 average, 23 homers and 98 RBIs in 158 games last year, but fell off a bit the second half of the season. Fielder has been primarily the designated hitter for the Rangers. He had played in 547 consecutive games and hadn't missed consecutive games since August 2007 before his surgery two years ago. "Obviously, Prince is a big part of this team. We know what he can do," third baseman Adrian Beltre said. "He was a great asset for us last year. We're going to miss him, but hopefully he'll get right." The Rangers were tied for the American League lead with 57 wins going into Monday night's game. But their AL West lead had shrunk to 2 1/2 games over Houston, from the 10-game division lead they had before playing 19 of their previous 23 games on the road. Fielder has been primarily the designated hitter for the Rangers. He had played in 547 consecutive games and hadn't missed consecutive games since August 2007 before his surgery two years ago. "Obviously, Prince is a big part of this team. We know what he can do," third baseman Adrian Beltre said. "He was a great asset for us last year. We're going to miss him, but hopefully he'll get right."